Around 5 p.m. Wednesday, officers attempted to pull Jared Singleton Anderson over on a misdemeanor warrant. 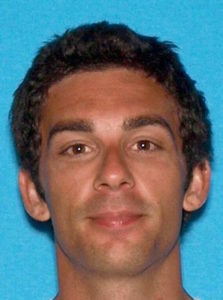 Anderson failed to stop initiating the chase on Kern Avenue in Morro Bay. Early on in the chase, Anderson allegedly tried to ram a patrol car. He then entered Highway 1 heading in the wrong direction and was weaving between oncoming traffic. Anderson drove eastbound on Highway 41, hitting speeds as high as 90 mph. Police called off the chase as Anderson entered areas affected by the recent Highway 41 mudslide. The suspect and his girlfriend, who was six to eight months pregnant, abandoned their vehicle in the Atascadero area. They were reportedly spotted running down a trail in the 14600 block of Old Morro Road West. Officers located the vehicle, and a CHP helicopter hovered overhead, but police did not find the suspects. On Thursday, authorities tracked down Anderson while he was driving in the Fresno area. A Fresno Police Department special response team arrested Anderson as well as his girlfriend. Morro Bay police are now seeking a new warrant for Anderson’s arrest on charges of felony evasion, reckless endangerment and assault with a deadly weapon on a peace officer. You mean to tell us that “These People,” our so-called “Authorities” in North County, initiated a life threatening high speed chase because this kid had a misdemeanor warrant? Wow! Let’s endanger the rest of society! They really must love their scorched earth policy and wasting thousands of dollars searching for a adventurous kid with a burned out tail light! Where do I sign up? Facepalm! I can’t help but feel sorry for the child about to enter the world with parents as worthless as these two. Cant help but feel like the kid doesn’t have a chance. Guess what justbeware, you will be supporting the spawn of those two for the next 18 years, at least. And they can breed up another and get paid even more! There is no limit in California for breeding more welfare babies. Yup, this is a stellar example of why we should be providing IUDs and other forms of birth control for free. It’s much cheaper than the alternative that we end up paying for. And what do you propose to ensure that couples such as this one utilize the free birth control? That would require planning and maintenance of ones health. These people live on impulse, not reason. The article says the warrant was for a misdemeanor. He has officially upgraded to several felonies with that little stunt.